Compression Sleeves and braces are all the rage these days, and with good reason. A good compression knee brace will bring many benefits to you, whether your recovering from a knee injury, have just had knee surgery, or accident or disability has left you with a weak knee or knee pain. While a traditional knee brace will usually protect you from worsening a previous injury, a compression sleeve works by protecting you from future injury by supporting the knee in key areas. Compression is also good for pain relief, and it increases blood circulation which can help with healing. At Apex Health and care, we are dedicated to saving you time and effort by bringing you the best medical products in easy to understand articles that save you from the hassle of trawling through the internet, and whatever kind of knee problem you have, we’#re sure that you’ll find the right compression brace here. Don’t let weak knees keep you on the sidelines, and get back onto the track confident that your new sleeve will make sure you are protected and supported against future injury. Why use a Compression Brace? These braces are really wonderful, as they will help out your poor old knees in so many ways. The main benefit from such a brace is in the added support that it gives you. While it might not be as much as a bulkier brace, it will still give that little bit of extra stability you need while lifting weights, running or anything else which puts pressure on the knees. Good sleeves also limit patella movement, which also makes a big difference in avoiding injury. They are also very useful for healing injuries, as the compression they provide will increase blood flow to the knee. This works both in relieving pain but also speeding up the process by which your body repairs knee damage. However, we must stress here that these sleeves do not give as much support to the ligaments as other traditional braces, so if you need a support to stabilize a damaged knee, these sleeves might not be enough, and you will need something a bit more heavy duty. However, for recovered knees that don’t want to risk another blowout, they are fine. If you think its time to get a compression sleeve, this one from Powerlix is one of the most impressive and bestselling we’ve come across. 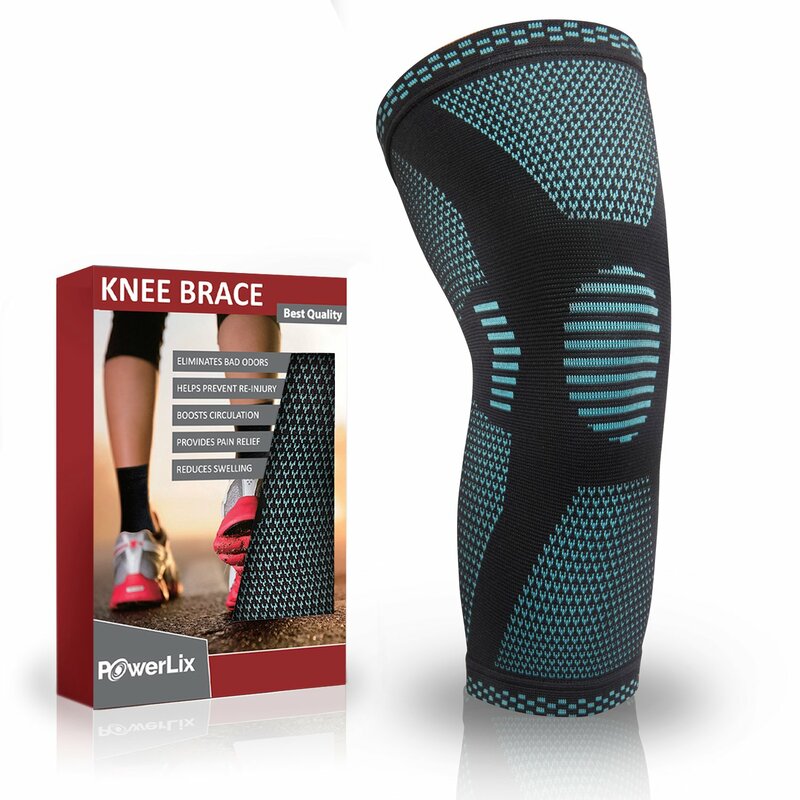 ThePowerLix Knee brace will have you feeling confident and safe as you exercise because it will apply stable pressure across your knee joint, which provides ultimate pain relief from a variety of ailments including arthritis, swelling, tendonitis, meniscus tear, soreness, stiffness, ACL, PCL, MCL, and other knee pain. With this sleeve, you’ll always be one step ahead of a repeated knee injury, and you can get on with your football, Crossfit, Soccer Golf, gym, Hiking, Running, Tennis, Volleyball and anything else you need to get that adrenaline rush! Best of all, with this on, you still have full range of motion, so nothing should be too much for you. We also like that this has a very high-quality of materials used in its construction. 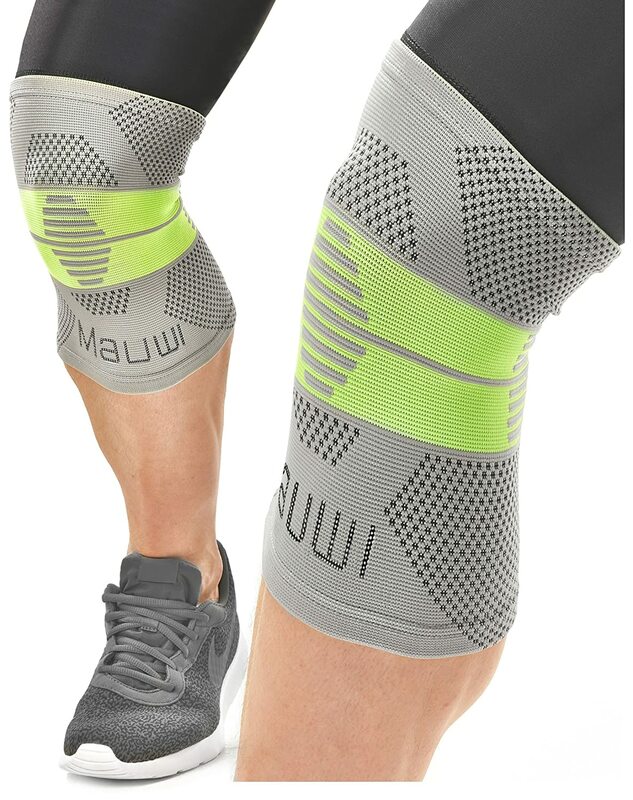 It uses a unique special knitted technical design with two silicone gel strips, to make sure that it doesn’t slip off while exercising,, and its tight, form-fitting, and breathable compression fabric maintains gives you a good bit of needed joint stability. 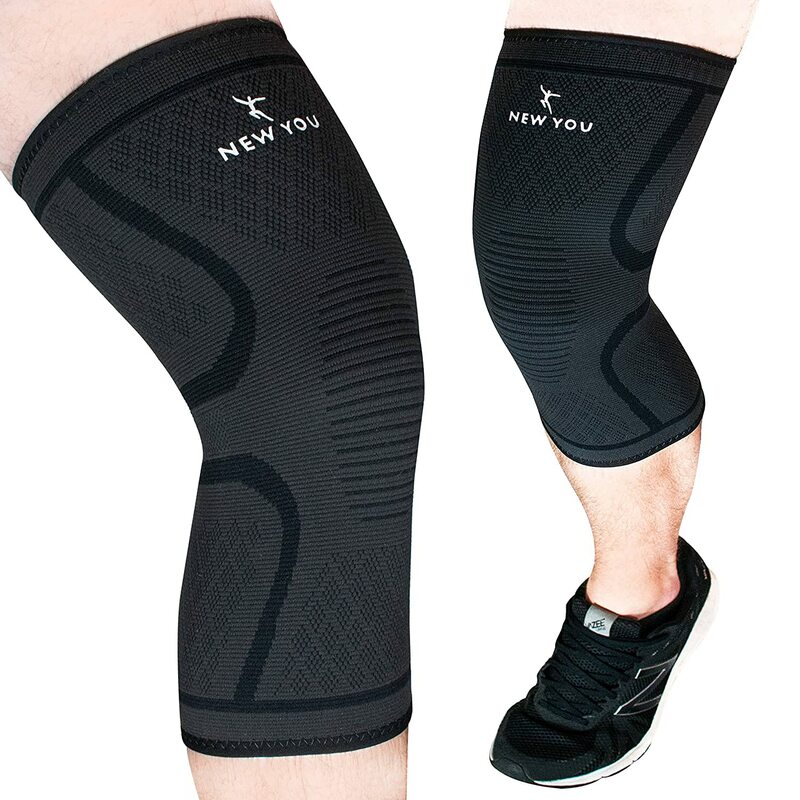 The compression also works well to improve blood circulation and ease any knee pain. All of this would be useless f the sleeve was itchy and uncomfortable, but this will feel smooth on your skin, and it is quick to absorb sweat and keep your leg dry and odor free. This is definitely a knee brace that excels in all areas. For intense physical exercise/heavy lifting, sports, jogging, joint pain relief and more, these compression knee sleeves will help you make sure that no damage comes to your precious knees, and will be a bit part of keeping you fighting fit for many years to come. These are light weight and woven from a soft materials so they will feel nice and comfortable on your skin. The breathable compression fabric will maintains joint stability while keeping your leg feeling nice and cool, regardless of the sport you are doing. They will also absorb sweat to keep your legs dry and odor free. These have been woven from a special Anti-Slip Silicone compound, so you won’t need to worry about the slipping off and turning into ankle warmers while you work out. As such, you can confidently wear them for a number of activities such as, squats,weightlifting, yoga, calisthenics , and just about anything else you can think of. 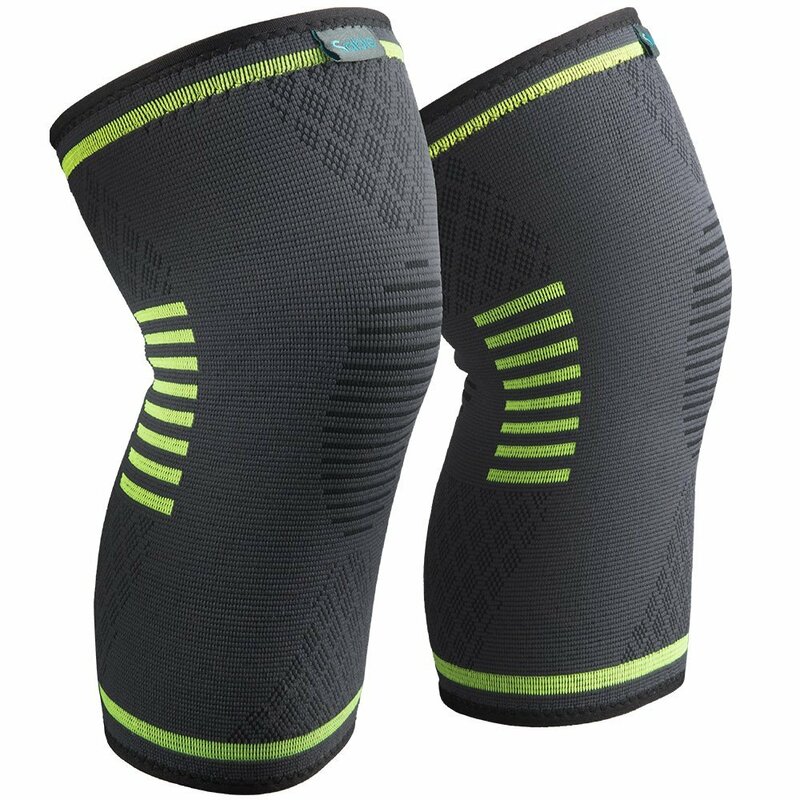 Whether its for added compression during your outdoor pursuits or for a little bit of pain relief, these compression sleeves will make your knees feel like they are being embraced and protected. On the other, this will give you the added support you might need for sports activities that involve a great amount of stress on the joints such as running, basketball, soccer, football, golf, cycling, tennis, hiking, volleyball, skiing and much more. Finally, it is made from anti slip silicone, so it’ll stay in the right place as you do your thing. This comes in Small, Medium and Large, so children and adults can find one in a size that suits them. Please check the product page for more details on which size you should get. Reduce the stress and swelling that comes with injury or exercise with these great braces. They will give you tight compression that reduces inflammation and will give your healing a bit of a boost so as to minimize the time you are on the bench. These come in a two pack, so they are great value for money and also ideal for those who need support on both of their knees. What makes these special is that they offer a wider coverage than most other supports, which translated into far more even pressure distribution. It stretches out above and below the knee in order to give even more protection and support than many other types of brace. This in turn means that you can enjoy demanding sports like basketball, football, volleyball, running, tennis, weight-lifting, and more without the fear of knee injury. Best of all, this comes with a lifetime warranty guarantee from the manufacturer. They are also had washable (cold water) so you don’t need to worry about them becoming grimy and stinky. 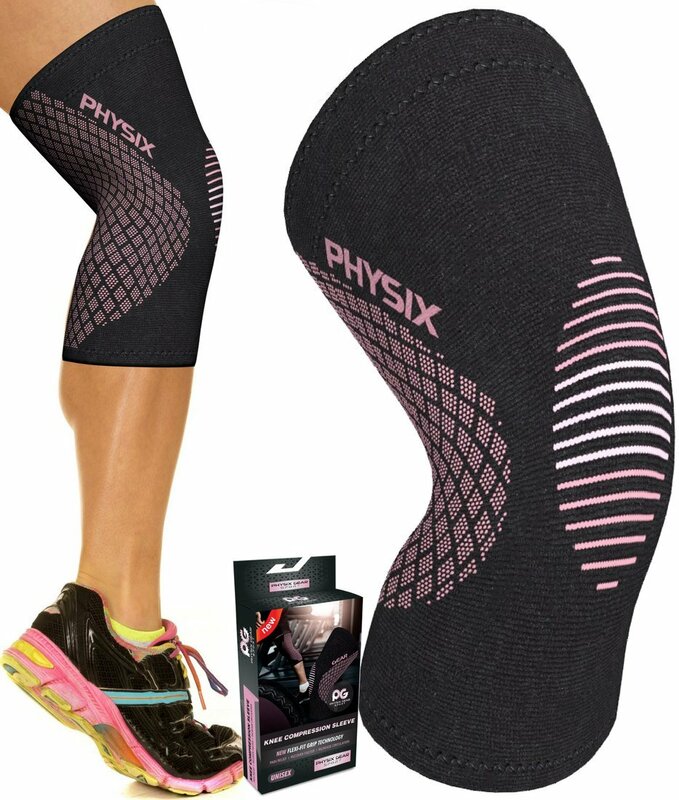 This one definitely gets our award for the coolest looking knee brace, and we really love its black and pink color scheme. Good news is that the brace itself is juts as impressive as that hot pink. Made with durable 4 Way Stretch Lycra, this support works against stiffness, pain and inflammation in your knees while giving you a bit of extra stability and strength. It is also very discreet, so you can easily slip in on under your jeans or work clothes if you are healing up from a knee sprain or knee strain. This is a nice, lightweight support that won’t weigh you don’t or restrict your movement. Its blend of breathable Nylon and Lycra feel super smooth on your skin, and the only real problem is that you might get so used to wearing it that you never want to take it off. 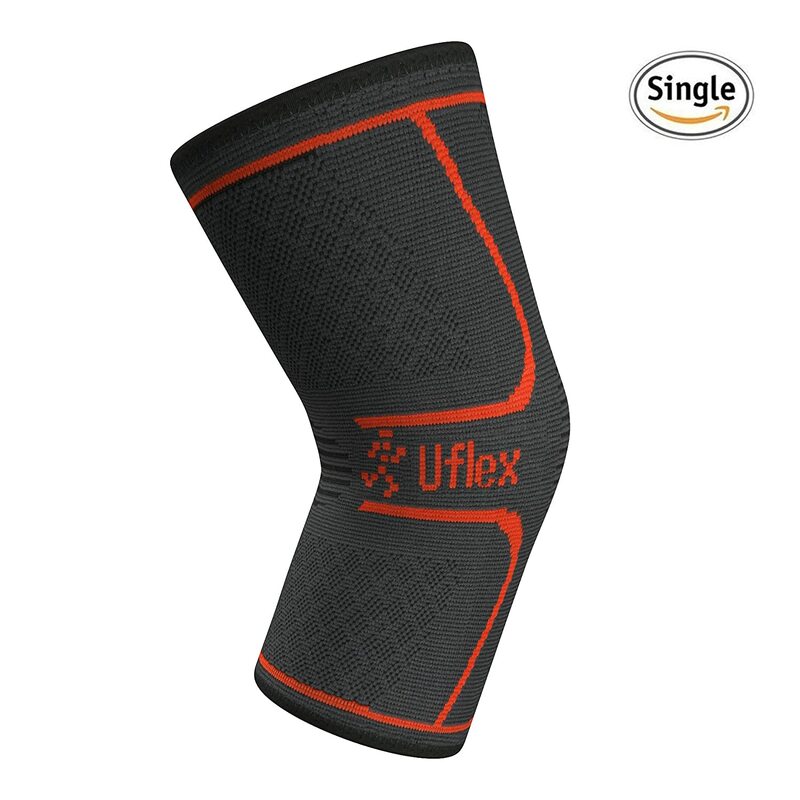 Thanks to its special ergonomic form and patterns, this knee sleeve will let you enjoy sports like running, volleyball, basketball, crossfit or exercise with confidence and ease. 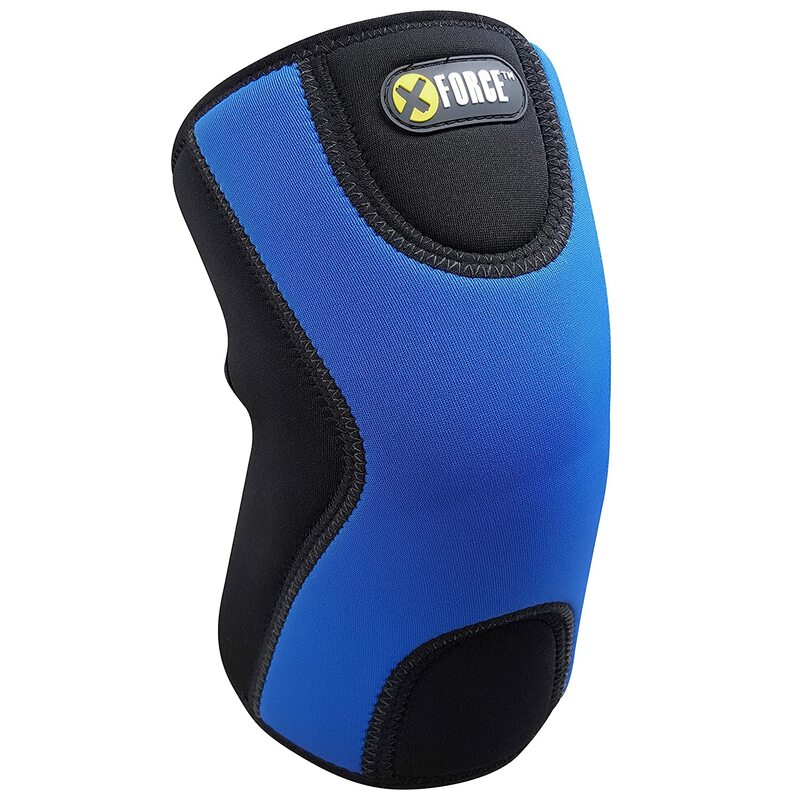 Looking cool and very effective, this stunning blue support can be a big help if you are looking for something to help out with injury recovery, arthritis, ACL problems, jumpers knee and pain relief, or if you need a but more support for any intense activities like running, jogging, basketball, soccer, weight lifting and more. This has a really unique design with a double neoprene layer surrounding the knee cap, which gives you twice the compression of many of the other sleeves on this list, yet it still doesn’t cut down on your mobility. With all that extra compression, we really recommend this one for people who need that increased circulation for post op recovery or nursing a bad knee sprain. This is available in sizes small, medium, large and extra large, and they also come with a one year No-Hassle Replacement Guarantee for free. This knee brace is light as a feather, yet it really make your knee feel solid and supported when you slip it on. This one also help keep your knee really warm, not only feeling snug, but it helps with circulation that aids healing, and it really works well in keeping down swelling as it has a unique 4 way compression system. This is also great value for money as each pack comes with a pair of braces, so its great if both your knees are weak/sore or you want to have a spare lying around in case you lose one at the gym. 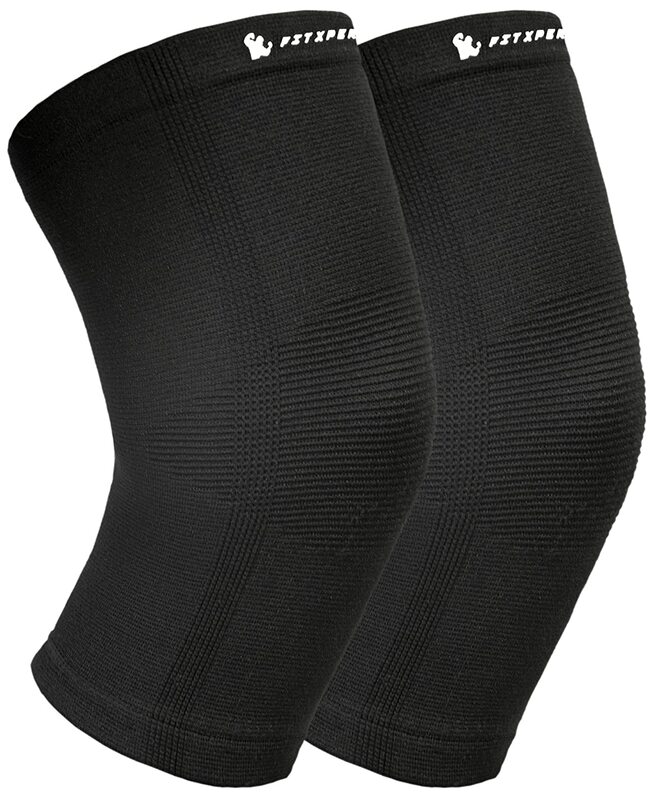 This stylish knee compression sleeve provides an ideal amount of support to help you cope with knee pain, and it might be a really good aid in a speedy recovery from accidents and conditions like runner’s knee, meniscus tears, arthritis, tendonitis, and injuries to the ACL, PCL, MCL. Ergonomically designed, these New York sleeves allow for a full range of motion while wearing, so you can still take part in your favorite sports, and they have double-lined anti-slip silicone for superior comfort and ensuring that they stay on while you work out. Also, it gives a heating effect which can be key in triggering speedy muscular recovery. Each knee brace is made of durable, breathable, non-slip material. 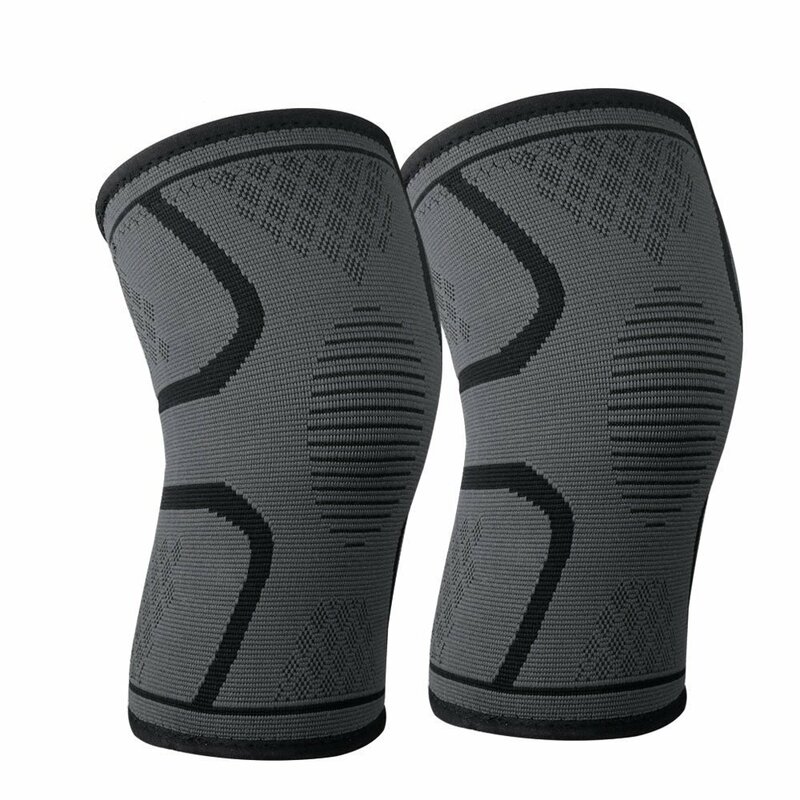 If you suffer from Runner’s Knee and need a patella knee brace, or are merely plagued by chronic knee pain, this is the sleeve for you. Likewise, if you’ve had a serious knee injury in the past, this could be a good way to help avoid new injuries in the future. 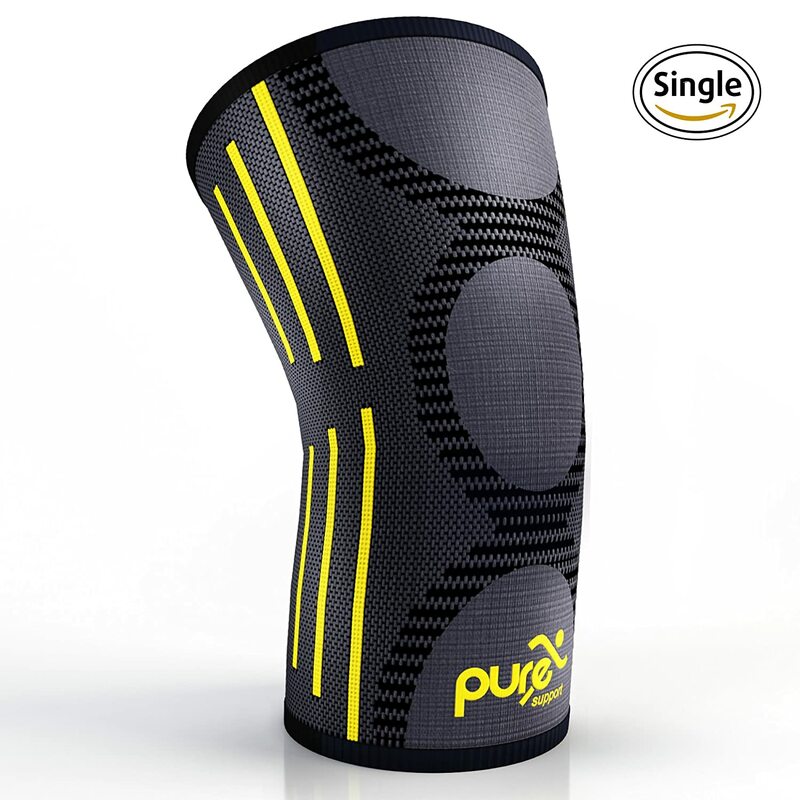 This cool black and yellow sleeve with is brilliant for helping speed up your recovery from knee injuries or surgery and to get quicker relief from joint pain. Wear it helps limit patella movement, making repeat injuries less likely to happen. It can also improve preconception, the process by which your brain can feel when a joint is out of place. This knee brace will also help out of you are have suffered a meniscus tear or you have problems with arthritis, tendonitis, osteoarthritis, runners & jumpers knee and similar conditions. It was designed to apply graduated compression without restraining your freedom of movement and without the risk of blood clots, so whether you want to wear it for a few hours at home or while you hit the gym, you can do so in confidence that your knee with be safe and protected. This is available in sizes ranging from small to large, and it also comes with a free e-book on’How to deal with Arthritis’, which is pretty as far as free stuff goes. Before you buy one of these compression braces you’ll want to double check on a few things, as there can be quite a lot of variety in them. Type – There are all different types, and you should find one to suit you. There are some very lightweight ones that simply compress and give a tiny bit of support while others are specifically for healing or pain relief. If in doubt, please consult with your doctor or physio therapist in order to get a pro recommendation. Durability – You’ll want to get a knee aid that will last you a long time, so we recommend looking for something made of sturdy fabrics and also something with double stitching. this should make sure that it lasts for many hears. How long to wear it for – Unless you have been specifically advised to do so buy a doctor, we don’t recommend that you wear the knee brace all the time. For one, its good to use it sparingly so you can air out your skin and let it breathe. But mostly, these are just a little additional help to be worn during physical activity to protect your knee from a new injury. They are not a replacement for necessary knee surgery, not can they repair a blown out knee or torn ligament. Also, research has shown that if you wear a brace for two long, your leg muscles and joints get used to the added support from the brace, and actually end up getting weaker. If in any doubt, please consult with a competent medical professional. How does Skin Compression Improve Healing? However, if you have any of the following conditions, using skin compression devices such as compression socks or braces is not recommended, and please do check with your doctor before buying such an item.